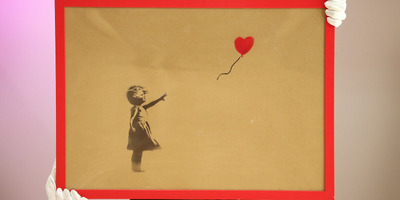 Banksy booby-traps his ‘girl with balloon’ painting to self-destruct after a phone bidder pays £1.04 million for it. The prank at Sotheby’s auction takes the art world, and the new owner of the destroyed work, by surprise. There is speculation that the prank may have significantly increased the artwork’s value. LONDON – The legendary street artist Banksy has booby-trapped one of his most famous works to self-destruct right after it was auctioned for over £1 million, in an apparent bizarre prank at the Sotheby’s Auction House in London on Friday. 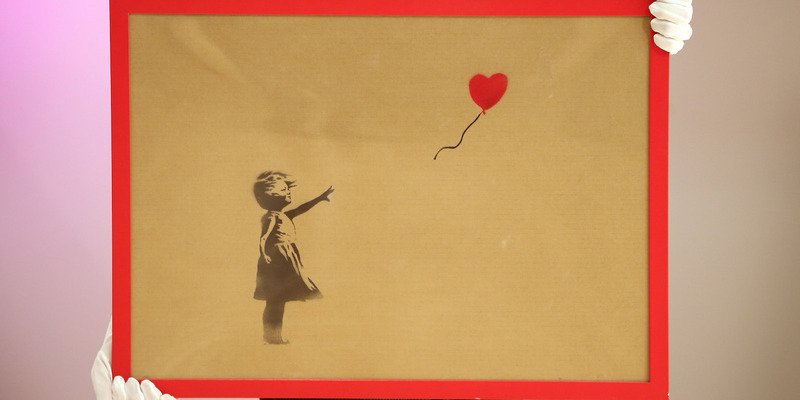 As soon as the ‘girl with balloon’ painting was sold to a phone bidder, part of the painting shredded due to a previously hidden device within the frame of the artwork. “We’ve just been Banksy’ed,” Alex Branczik, Sotheby’s European head of contemporary art, told journalists following the auction. “We have not experienced this situation in the past . . . where a painting spontaneously shredded, upon achieving a record for the artist. We are busily figuring out what this means in an auction context,” he added. $1,300,000 BANKSY artwork piece just “self-destructed” right after it was sold at Sotheby’s auction!???????? “We have talked with the successful purchaser who was surprised by the story. We are in discussion about next steps,” they said in a statement.